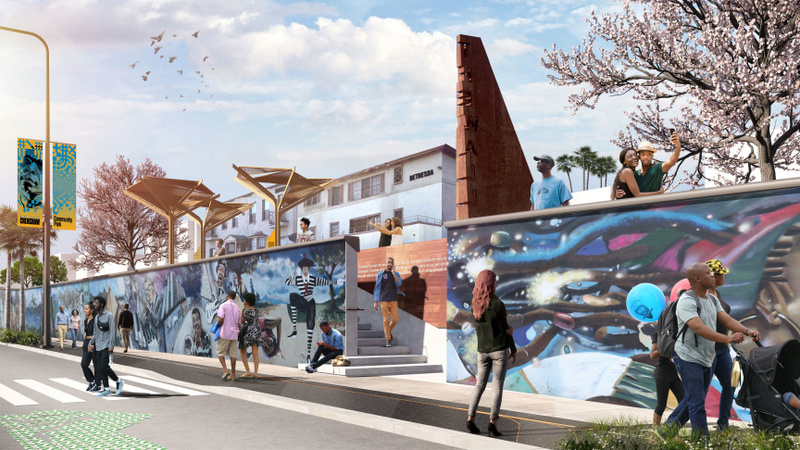 When the Metro's new Crenshaw/LAX line opens in summer 2020, riders will travel through a 1.3-mile-long art project celebrating L.A.'s African-American achievement. 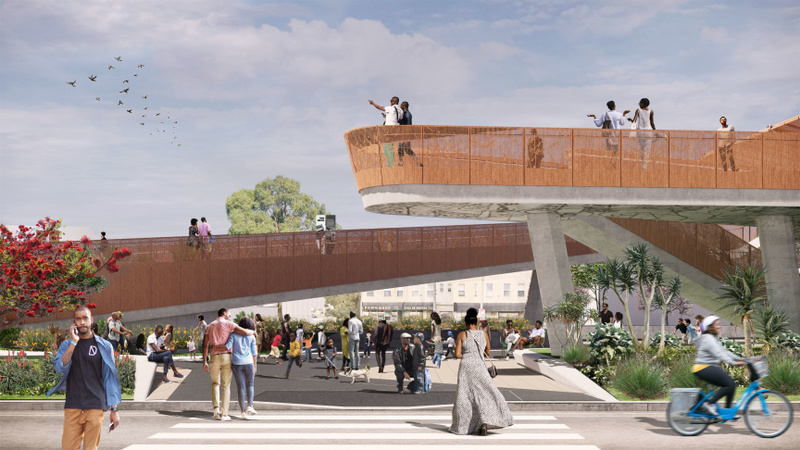 "Destination Crenshaw" is set to break ground in early 2019, and will flank the route along Crenshaw Boulevard. Renderings were released earlier this month. "The hope,"Councilman Marqueece Harris-Dawson said, "is that [people] understand that L.A., among other things, is quintessentially a black city. In the same way that it's a Latino city, in the same way it's a Jewish city, in the same way that it's a Japanese city. The stories of black people in this town are central to what this town is, and what it continues to develop into." 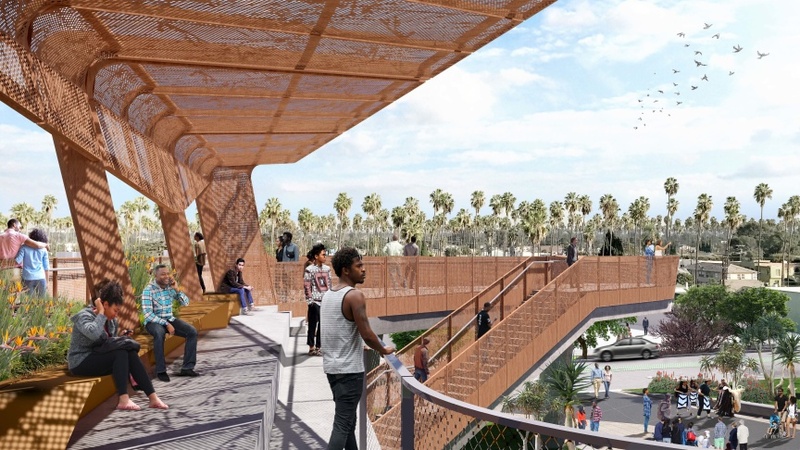 Harris-Dawson called Destination Crenshaw an "open-air museum" that is set to feature monuments, art, park space, and other cultural experiences celebrating black Los Angeles. It'll be one of the first stops for people taking the Metro from LAX, with clear views of the surrounding art. The inspiration for the project was the Crenshaw Wall, Harris-Dawson said. That's the massive graffiti project that already stands in Crenshaw, which Harris-Dawson wants to see restored and enhanced. "But also many of our artists that are in this community have art that you have to travel outside South L.A. to see," Harris-Dawson said. "We wanted to create a space for them to show their work in their own neighborhoods." The space will have more than 125 spots for art, according to Harris-Dawson, including 3D art, street art, fine art, and more. The art will tell stories curated by the project's historian. "There may be a [play structure] there that may spell out the words, 'say it loud,'" Harris-Dawson said. "So that's a way in which, as a park, it is a functional tool, but it tells a story about political protest, and community confrontation, and African-American music in a direct way." Actress/creator Issa Rae and rapper Nipsey Hussle have signed on to help raise visibility for the project. Harris-Dawson hopes Destination Crenshaw will help bring back creative businesses and boost the local economy. "African-American culture is consumed by the world, in every corner of the world, but African-American neighborhoods have not necessarily been able to take advantage of that," Harris-Dawson said. "Whether it's streetware and street fashion that is largely generated by young people in the Crenshaw neighborhood — they make a sneaker popular, and then you have to go to Melrose to get the sneaker. And the same is true for all forms of art," he said.